How to buy the best paper toilet holder cabinet? Small cabinets for bathrooms storage,narrow bathroom cabinet free standing to store toilet papers and bathroom accessories. Modern bathroom furniture great for small spaces,easy to move or carry outside; Storage unit with doors and shelves, cut the right size to keep extra toilet paper and hand towels; great to put in the bathroom between the tub and the toilet. Top panel open to replacing the roll paper, the top compartment great for holding a cell phone or a coffee mug; keep your comb hair products and deodorant in ; Interior has 1 fixed shelf,middle small cabinet shelf to storage 4 paper rolls and fit fine , each shelf storage more than 3 bottles of medium capacity shampoo. Made of environment-friendly wood and plastic mixed material, not MDF material, without any painting, with light weight, waterproof, fire-retardant,moisture proof, BPA & Formaldehyde-Free,non-toxic,odorless,never fading,safe & Eco-friendly, worked great in the bathroom. Easy to put together: put 2 door pins into top shelf,bottom shelf's hole, connect top,middle,bottom shelf with back panel; Connect top open shelf with left side panel's hole,connect front panel with left side panel; Connect door into top,bottom shelf's hole,attach right side panel to connecting with above parts; Insert 8 screws to tighten with two side panel's hole ; Attach knob to door with 1 screw to tighten. Material: Wood Plastic Composite Board,a new composite material to replace traditional wood and plastics. The tissue cabinet is a beautifully discreet solution for bathroom storage. 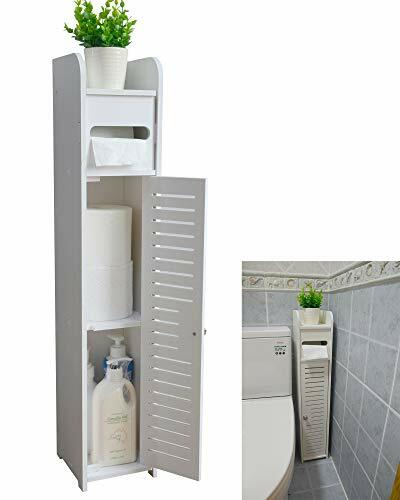 This exquisite toilet paper stand fits in narrow spaces with strong storage functions: organizing tissue papers, toiletries, bathroom cleaners and more!The top panel can be opened for replacing the roll paper, when you replace it ,just make sure paper towel will be pulled out from below,which the direction will be much easily to pull the paper out.The top panel also can be put for mobile phone ,tissue paper and decorations.The interior has 1 piece fixed shelf, which can storage 4 paper rolls in all, 2 paper rolls in each, or storage for 3 bottles of medium capacity shampoo and shower gel for each shelf at the most . Durable and Eco friendly matetial, will protects your families keeping your air free of benzene,formaldehyde and other harmful substances.